The smallest yacht in the range, the Xp 33 is designed for pure sailing enjoyment. This model is a high stability 30-footer which benefits from the same advanced construction techniques as the larger yachts in the Xperformance range for superb sailing performance and build quality. The Xc 42 was launched in 2009, following the same philosophy as the Xc 45. The second yacht in the Xcruising range, offers no-compromise comfort and impressive pace combined with ease of handling. The X-65 offered ‘Maxi’ yacht performance and cruising comfort, in an accessible 65ft package. This model was a high specification, high performance cruising yacht, which exuded X-Yachts quality throughout. The X-34 has been designed and specified to deliver the best of both worlds: Highly competitive on the racecourse as an IRC flyer one weekend. Then the following weekend capapable of taking the whole family out for lazy cruising and entertaining. The X-41 is another hit on the sailing scene. Sporting the latest within fast hull and appendage design; a non overlapping headsail configuration; double spreader, carbon mast and boom from one of Europe’s leading suppliers; large diameter carbon wheel; all trimlines leading to both sides of the coach roof; and a backstay adjustment run via the Magic Wheel. X-Yachts latest one-off project, sold to an existing X-562 client. The hull and deck was laminated in the UK by Green Marine with Gurit (formerly SP-Systems) supplying laminates and engineering. The creation of this inspirational yacht has led to many new design solutions that will feature on future models. The vision behind the design was to create a sporty and simple yacht to sail, with extremely pleasing lines. Below deck she provides comforts suitable not only for the crew after racing, but also for the active family during a weekend trip or for holiday cruising. A replacement for the exceptionally popular X-412. The X-40 is part of the second generation of X-Yachts’ Performance Cruisers. The hull model was made by extending the IMX 40 by 100mm, modifying the bow rake and adding a cruising oriented deck layout and teak interior. The X-40 has proved to be as competetive as the IMX 40, and rates more favouable in both ORC and IMS. 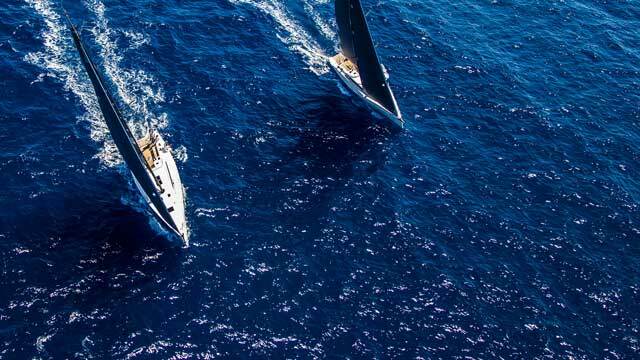 ”Sirena”, owned and sailed by Denmark’s Peter Buhl, has won many major races in Denmark as well as the 2005 X-Yachts Gold Cup in Arendal, Norway. A relatively narrow yet stiff 37-footer that has won a number of prestigious regattas and races worldwide. The latest notable result was a third consecutive win in the ORC 670 World Championship, with the 2008 event sailed in Lanzarote, Spain. When launched she was highly praised for her stunning looks and great performance. The X-50 was another trendsetter with her flat deck, sprayhood recess and open transom. She is sleek and stylish with a modest beam for her length. Stability comes mainly from a heavy lead bulb. The X-50 is largely sold as a fast cruiser, enabling the owner and his crew to reach far horizons quickly and in comfort. This was another trendsetter for the marine industry and represented the start of a new generation of yacht design. Her hull lines were created by a pure downscaling of the stunning IMX 45. The X-43 was smoother, heavier and stiffer than the competition. All the boats were fractionally rigged and all featured built-in hull portlights. Just two months after the launch of the all new X-43, came the unveiling of the X-46. The hull was developed by adding 30 cm to the stern of the IMX 45 hull model. The X-46 features a large sail storage cabin but otherwise is identical to the concept of the X-43. The IMX 45 was introduced on the back of the success of IMX 40, but also incorporated features that made her appeal to a wider audience such as an interior crafted in teak, an optional anchor locker and below deck headsail furler. Production started in the spring of 2002 and 24 yachts were launched, eight of which participated in the “Copa del Rey” in Palma, Mallorca. An X-612 owner wanted X-Yachts to supply his final yacht. X-Yachts 73 took the company’s experience to new levels and integrated as many complex installation systems as possible. Two of these fantastic, true blue water cruisers were built. This design closed the gap between the X-482 and X-612 and was built with the same high standard specification as her bigger and smaller sisters. In effect she was a petite version of the X-612 with the benefit of the very latest detailing. An open transom version was also developed. In 1998 the X-362 Sport was introduced. She had a deeper, lighter keel, fractional rig, enlarged wheel and mahogany interior. The X-482 replaced the X-512 and incorporated most of the deck details introduced on the X-612 such as the main sheet systems being led beneath deck and integrated storage for the sprayhood and captive wash boards. In common with the first three models in the new Performance Cruiser range, the X-382 sported a large masthead rig, a large wheel, and a teak interior with moulded teak bulkheads that ensured maximum use of space. The X-382 was mainly focused on the cruising market, but was completely in tune with the new line, offering excellent sailing performance and comfort. The X-612 represented another milestone in the company’s development. The design incorporated honey-comb-cored sandwich bulkheads and floorboards, recessed sprayhood storage and mainsheet led under benrath the deck. There was also a stern garage for a 2.8 m RIB, something never seen before on a yacht of this size. Owners included Hanseatische Yachtschule, the world’s largest sailing school. One example, “Dali”, raced in Scandinavia for several years, under the control of X-Yachts’ world-class sailors, Dan Petersen and Niels Ditmar. Replacing the X-312 using almost the same hull, though with a less raked bow and stern. The first series was delivered with a composite cast iron/lead bulb keel, which made her very stiff. A cheaper cast iron keel version was subsequently introduced with improved light wind performance. Developed in parallel with the X-302 and one of the most successful and popular X-Yachts models ever. The X-332 was unmatched in the way she combined performance and comfort. A composite cast iron/ lead bulb keel and fractional rig with discontinuous rod rigging were standard. Later a Sport version appeared featuring a deeper, lighter keel, to match developments of the IMS rule. The third Performance Cruiser also became a “classic” and remained in production for more than 10 years. She was stiffer than the competition, and soon she became a benchmark for designers and builders of this new breed of performance cruisers. This was an exceptionally stiff yacht and appealed to more conservative sailors who demanded high levels of comfort. First introduced with a masthead rig and a curved mahogany interior. A more traditional teak interior was subsequently offered. The good looks of the X-382 were obvious from the moment she emerged from the production mould. She was so appealing that the idea was born to create a new racer/cruiser that would perform well under the dominant IMS international handicap rule. X-Yachts’ first model in the new “Performance Cruiser” range where the influence of IOR had completely disappeared as IMS became the dominant international handicap rule. The X-412 became another trendsetter and remained in production for more than 10 years. The last X-Yachts model built to win an official World Championship. Greek banker, Yannis Costopoulos was the owner of the 1988 and 1989 “World Champion” X-3/4 Ton yachts (“Okyalos IIX” and “Okyalos IX”) and ordered the best one-off One Ton that could be built. “Okyalos X” duly won the One Ton Cup in Marstrand, Sweden. Entering the 50ft market for the new Performance Cruiser range, sporting twin wheel steering, a large masthead rig and a comfortable teak interior. Designed to replace the X-95 she was kept simple, yet practical. The X-312 sported a fractional rig and tiller steering and was the first X-Yachts model to benefit from a stern integrated bathing platform. IOR had become less important as handicap rules were more locally based and didn’t take the stability into account. This allowed for the production of a much stiffer yacht than the IOR-designed X-102 and X-95. A masthead version was offered but almost all clients chose the fractional rig. Originally sold as a one-off to a Swedish newspaper publisher, with the rights for X-Yachts to put into production. She followed the X-79/X-99 design philosophy, featuring a T-keel and became popular among those who wanted a very fast, non-handicap racer/cruiser. With the demand for IOR cruiser/racers fading, the X-372 was designed without consideration towards handicap rules. A Sport version was offered with tiller steering and fractional rigging while the popular Prestige version had wheel steering, teak decks and a masthead rig. Built in the same hull mould, this luxury version of the X-452 was very much oriented to cruising. A variety of layouts, including three- and four-cabin versions were offered and became popular around the Mediterranean. Based on the same hull as X-402, but with new deck layout, keel and rudder as well as a lighter interior and modified sail plan. The Irish owned “Alliance” finished eighth at the first One Ton Cup, with IOR’s upper rating band of 30.55 ft, sailed in La Trinité, France. In 1985 Hull 05 “Maitresse”, together with two other X-One Ton yachts, formed the first ever Danish Admiral’s Cup team and came fifth. X-One Ton “Euro” was the third best scoring individual yacht. The successful modifications made to the X-3/4 Ton were also introduced to the X-One Ton. The prototype was nicknamed “Dolly Parton” as her measurement bumbs were quite impressive! Hull 14 “Andelstanken” won the One Ton Yachts World Championship in Mallorca in 1986, skippered by Henrik Søderlund of North Sails with tactics by Niels Ditmar from X-Yachts. The X-One Ton “Seaways” came fourth. Launched in July 1985 as a big sister to the X-79. More than 100 units were presold and initially four yachts had to be built each week to satisfy the hungry market. The X-99 became X-Yachts’ first ISAF recognized class, and still hosts annual World Championships. X-99/155 “Hong Kong X-Press” owned by X-Yachts Hong Kong importer Rick and Inge Strompf, participated in the X-99 World Championship in Copenhagen in 1987 and the following year in Vejle, Denmark, where they won the title with Volvo 70 “PUMA” skipper, Ken Read, at the helm. With a modified hull (including added measurement bumps), a new semi-elliptical keel and rudder and increased stability and sail area, this version came first, second, fourth and fifth in the Three Quarter Ton Cup World Championship. A winner was born! Based on the hull mould of the X-102, with a new deck, keel and rudder, as well as a new interior and sail plan. Hull lamination was also improved incorporating unidirectional carbon and R-glass fibres in both hull and deck. Came fourth at the official “Three Quarter Ton Cup” in Kiel, Germany, in 1984, beaten by the first Dehler DB2. The first 40ft model was a true trendsetter with Hull 01 “X-Large” having its World Premiere at Copenhagen International Boatshow in January 1984. Sporting a large diameter wheel and rod rigging as standard, she was offered with both masthead and fractional rigs and opened up the more luxury oriented market for X-Yachts. The masthead version proved the most popular. The third model was a scaled down X-102, and was designed to race in the popular Half Ton class. Won the World Championship for production half tonners in 1983 in Hankö, Norway. The second X-Yachts model launched was a true cruiser/racer sporting a centre cockpit. It was designed for IOR’s 3/4 Ton upper rating limit of 24.55ft. Hull 07, “Soldier Blue”, won the 3/4 Ton World Championship in 1981 and was skippered by Ib Ussing Andersen, helmed by Jens Christensen with tactics by Lars Bo Ive, all now of North Sails fame. In 1982 “Lille du” won the same title and gave X-Yachts a head start in the international yachting arena. Launched on May 9th 1979 and instantly became a successful Northern European one design class that is still active in five countries.